In a large frying pan, sautè squash, onions, garlic and butter until soft, approximately 10 minutes. After finished, add in the cheese, stirring well. Then add the beaten eggs and seasonings. After combining everything, pour into prepared crust. Bake in preheated oven at 350 degrees for 20-30 minutes or until the center is set. Remove to a cooling rack for at least 10-20 minutes so it will firm up slightly. This is not a very firm quiche, but the longer it sets, the more firm it well become. There are times, especially in the summer, when I end up with a pile of zucchini all at once. That is when I will make zucchini (or a mixture of zucchini and summer (yellow) squash) quiche, zucchini jam, zucchini bread or cake. Even though this is not summer, my husband came home from our favorite nearby store the other night with bags of reduced and free zucchini and yellow squash- boy, it pays to shop there later at night! So I have pulled out those summer recipes and decided to make them up and share here. Besides, I'm looking forward to spring/summer after this long winter! In this picture, I made the quiche with only yellow squash- not the zucchini. My sister-in-law, Lois, gave me this recipe a few years ago, and it has been a huge favorite in our family ever since. I have added some extra spices and seasonings. This is an easy crust- just use tubed crescent rolls and spread out in the pie crust and smear some mustard around before adding the squash mixture. 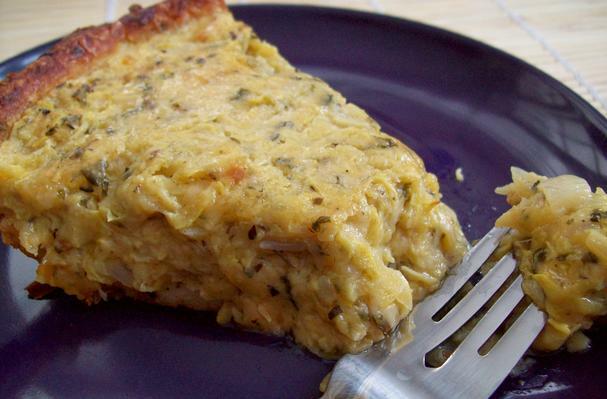 The flavor is a wonderful blend of cheese, savory egg and squash-- yummy! This is good any time of day- we have a hard time eating just one piece! It is even delicious reheated later.